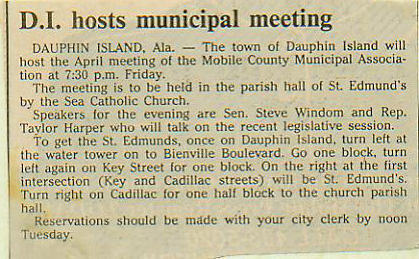 February 20, 1990 - Dauphin Island's second annual Migration Celebration, which also conincides with the second anniversary of the town, will be held April 21. Mayor Doris Anderson and the town council officiallyt approved the date during the regular town council meeting Tuesday night. The council also approved April 28 for the hosting of the 1990 Dauphin Island Race, sponsored by the Buccaneer Yacht Club. Jimmie Morris, publicity chairman for the Migration Celebration, said the celebration is to observe the transit of hundreds of species of migrating birds throught the island. Dauphin Island has been officially declared a bird sanctuary and thousands of bird flock to the island annually. Jack and Marti Harding are chairpersons for the annual event and will coordinate the responsibilities of the various committee. March 1, 1990 - DI holds first municipal court hearing.... Residents of Dauphin Island came out in full force recently to witness a brief page in the history of this resort island and to show support for the police department. It may have been just a small piece of history, but history was made on Dauphin Island as another chapter was written. As the gavel sounded at 6 pm on Tuesday Feb. 20, Municipal Court Judge Charles McKnight signed his name in the history books of Dauphin Island. It was the first municipal court hearing in this infant town. The room was packed with residents who had come to be a part of history in-the-making. Many had brought their young children to watch and take pride in what their town had accomplished in just two short and very busy years. Why so many people for a traffic court hearing? "We wanted to show our support for the police department and the new court system," one spectator replied.